My, what fun there is to be had with the St Andrews University Face Transformer! Verily, ’tis the stuff of nightmares. And what a SHAME there wasn’t a decent sized full-face photo of myself to play around with. Update:Oh, very well. It’s only fair, after all. While Elderly Mike terrifies me (the whiskey-soaked bottom-pinching scourge of Harpenden Conservative Club), I think that Caucasian+ Mike (middle manager, keen gardener and church warden) possibly represents a truer articulation of my fears. 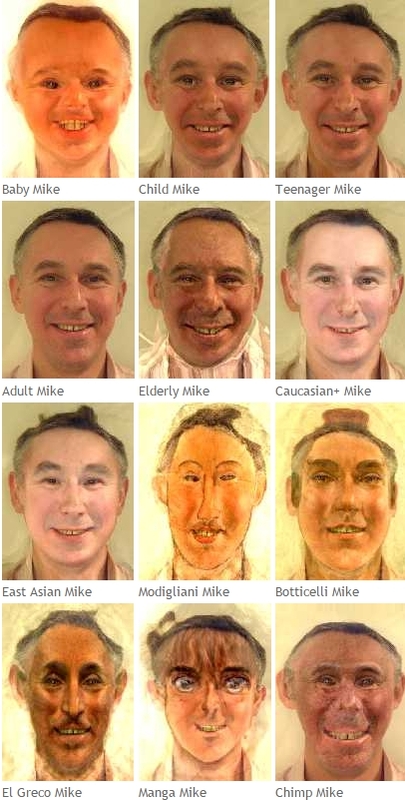 Whereas East Asian Mike is Bert Kwouk.